EARN $500 A MONTH PART-TIME IN THE FREE ONLINE CLASSIFIED BUSINESS! Make Great Money - three (3) EASY ways: 1) Earn 50% commission for referring advertising upgrades to FREE local business directory and classified ads website; 2) Make a 10% commission on ALL upgrade ads placed by anyone within your "exclusive territory", without your referral; and 3) Make 10% overriding commission for signing up other NoPayClassifieds.com Assistants. Use all three, or just focus on two - devoting one hour per day!!! You can make money in this business. What is our money-making secret that is in 50 countries in the world? NoPayClassifieds.com, and they would like to pay you for building dominance in the FREE online classified and local business directory business - the format that many analysts think will define the future of e-commerce, as e-bay auctions are still too hard for many consumers to navigate. By simply referring individuals and businesses to the NoPayClassifieds.com System, you have the opportunity to earn $500 a month part-time and once we reach that goal, together we will work on your first $1,000 a month, part-time. That's correct - just for making a referral. It couldn't be simpler. There's no selling involved as you are offering FREE online advertising to community business members within NoPayClassifieds.com "LOCAL BUSINESS DIRECTORY" and FREE online classified ads designed to function the same as the local classifieds within the newspaper, offering listings within 485 categories that are divided into 24 sections, to the people within your local community. Again there's no selling involved and virtually no competition, but there are great profits from three easy ways. You simply have the community members within your "exclusive territory" sign up for a FREE REGISTRATION/ MEMBERSHIP within NoPayClassifieds website with no cost or commitment. The FREE REGISTRATION/MEMBERSHIP will enable them to place FREE ads that allow for the display of six (6) color photos, maximum of 150 words to describe their item(s) or service, and a 75 character Headline, for forty-five days with unlimited FREE renewals. Your referrals are then paid directly to you upon all low cost advertising upgrades: a) text color ads; b) sponsored ad with link; and c) automated ad submission tool to submit ads to 200, 600, or 1,000 separate zip codes or postal codes at one time. Simply by referring people to NoPayClassifieds.com, you can pick up a nifty paycheck while helping community members save money. I know what you're thinking: "If this is so simple, why doesn't NoPayClassifieds.com contact local businesses and community members themselves?" The answer is that you have easy access to local resources, newspapers, yellowpages, radio, television and magazines whose advertisements can be republished by the advertiser into NoPayClassifieds.com at no cost. So it's easy for you to make the referral and it's less expensive than NoPayClassifieds.com advertising for it. This is why it works for everyone - from the community members, local businesses, and to the person making the referrals. NoPayClassifieds knows the best way to reach the maximum number of businesses, individuals and non-profits is to train qualified men and women as LOCAL NoPayCiassified ASSISTANTS to help individuals and businesses advertise and sell profitably within NoPayClassifieds. And the best part is that while you don't have to be a internet or computer expert, basic communication and computer skills are important. THREE STREAMS OF INCOME: As a LOCAL NoPayClassified ASSISTANT you telephone, email, and fax people within your "exclusive territory" and offer them a FREE business listing and/or classified ads to sell or request items within 485 categories of the NoPayClassifieds.com website. In many cases, local businesses will republish existing advertisements within NoPayClassifieds, a three to five minute process. FIRST STREAM OF INCOME: You profit 50% on all of your direct referrals within your "exclusive territory" who choose to upgrade from FREE advertising. Low cost advertising upgrades include: a) text color ads; b) sponsored ad with link; and c) automated ad submission tool to submit ads to 200, 600, or 1,000 separate zip codes or postal codes at one time. You simply have your referral sign up for a FREE REGISTRATION/MEMBERSHIP within the NoPayClassifieds.com website with no cost or commitment, and enter in your name and ID number. You are guaranteed your 50% override commission on all future upgrade ads placed by your referral within your "exclusive territory", as the LOCAL NoPayClassified ASSISTANT, once they have signed up for a FREE REGISTRATION/MEMBERSHIP. SECOND STREAM OF INCOME: Best of all for the LOCAL NoPayClassified ASSISTANT, NoPayClassifieds provides a simple way to make money again and again on "equity participation" on all upgrade ads placed from within their exclusive territory", where you become the LOCAL NoPayClassified ASSISTANT "marketing partner". You earn a 10% override commission on all upgrade ads placed by anyone within your "exclusive territory", if they have not entered your name and ID number when signing up for FREE REGISTRATION/MEMBERSHIP within the NoPayClassifieds.com website, no matter where they advertise within NoPayClassifieds.com. THIRD STREAM OF INCOME: NoPayClassifieds.com also has an additional incentive to become a LOCAL NoPayClassified ASSISTANT that results in an even larger income potential. Each LOCAL NoPayClassified ASSISTANT has the ability to sign up other LOCAL NoPayClassified ASSISTANTS in the program. When they do, they earn a whopping 10% override commission! So if one downline LOCAL NoPayClassified ASSISTANT earns $1,000 one month, their sponsor LOCAL NoPayClassified ASSISTANT receives a check for a $100.00! And this is income that can be received on a residual basis, while sleeping or on vacation! This is not multi-level marketing; it is 2-level marketing and it can be one of the most lucrative elements of being a LOCAL NoPayClassified ASSISTANT. Use all three of the above income streams or just focus on two - devoting one hour per day - you have the opportunity to earn $500 a month part-time and once we reach that goal, together we will work on your first $1,000 a month, part-time. See Footnote 2. Also NoPayClassifieds handles all the time-consuming details of transaction accounting, payment processing, and paperwork, so you have more time to develop referrals. CLIENTS ARE EVERYWHERE: We teach you the easy-to-use marketing methods to keep you as busy as you want to be, part-time or full-time, from the comfort of your home, eliminating office clothes, lunches, commute and daycare. You'll learn how to telephone, email or fax community members who are already spending money within magazines, newspapers, yellowpages, TV, radio and classifieds for advertising you are offering for FREE. NoPayClassifieds self-service system allows users to publish, edit, or remove their listings themselves. Most clients will republish existing advertisements within NoPayClassified in three to five minutes. It is that simple! Thanks to NoPayClassifieds no cost or commitment enrollment, LOCAL NoPayClassified ASSISTANTS are all but guaranteed to enroll just about every person they contact who is currently spending money advertising. YOU ARE YOUR OWN BOSS: This is not a franchise or multi-level marketing. Start-up capital of $1.00 per month is required to become a "Marketing Partner" with "Equity Participation" with one (1) "Exclusive Territory" - one zip code or postal code. There are no inventory costs and no collections! If you have a computer with internet access, basic computer and communication skills, some business experience, and like to meet people and help them, please click FREE BUSINESS INFORMATION PACKAGE under BUSINESS OPPORTUNITY in the NoPayClassifieds menu, so you may start making money by simply making referrals. Footnote 1: According to ENTREPRENEUR MAGAZINE marketers across the us will spend $42.3 billion on digital advertising this year (2013). Research firm eMarketer estimates that digital display advertising will account for $17.6 billion of that. 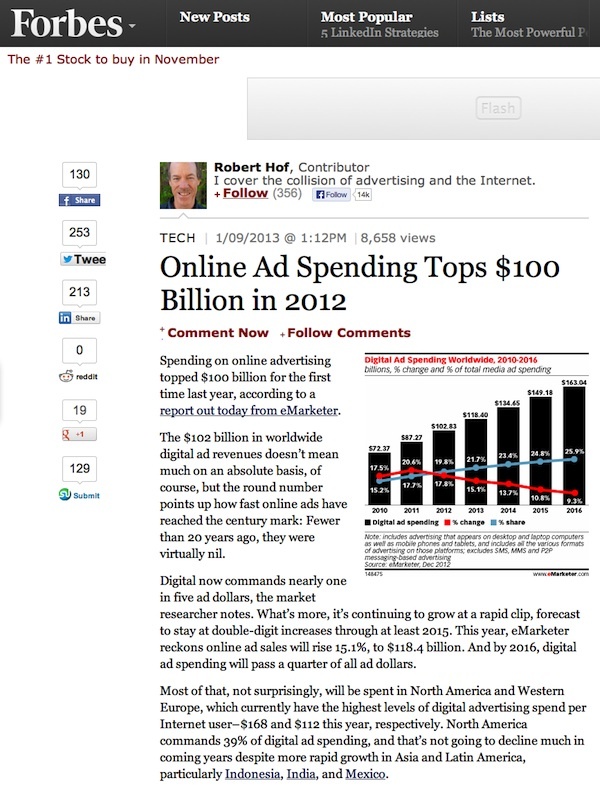 Footnote 2: Businesses worldwide spent an estimated $102 billion on internet advertising in 2012.